Charlotte is a qualified Insights Discovery™ practitioner, CEB Ability Assessor and Personality Profiler, so she is well placed to help impact and change leaders achieve their dream careers. 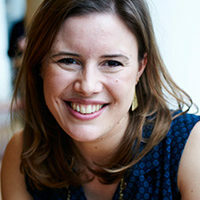 Previously she spent 10 years driving five high-profile global sustainability programmes as Sustainability Manager for innocent drinks and The Prince’s International Sustainability Unit, and on secondment from The Climate Group into McKinsey and Co.
For three years, Charlotte spearheaded and led The Prince’s Marine Programme, building consensus among 500+ fishing industry experts and gaining endorsements at The Economist World Ocean Summit 2012 in Singapore. A qualified Insights Discovery™ practitioner, Charlotte is well placed to help impact and change leaders achieve their dream careers. Charlotte has been interviewed on the BBC News and quoted in articles in The Guardian, BBC News, and Edie. She was one of five people to appear in a film alongside HRH The Prince of Wales and her strawberry project for innocent drinks won the Guardian Sustainable Business Award 2016. She has delivered 10 transformational team training and development workshops for innocent drinks and Thames Tideway, which have received 100% positive feedback. Charlotte holds an MSc Environmental Technology from Imperial College London, a BSc Geography from University College London. She currently lives in London but is always looking for an excuse to head for the hills. I once had a long heated argument with Nigel Farage on a plane - he was sitting next to me so had nowhere to hide! Four of my favorite things are long country walks, attempting to surf, playing music and going to old pubs. I haven't mastered how to do them all at once but I'm a bit of an expert at squeezing them all into a weekend!